Let’s Compare Teeter Inversion Tables Together! When you Compare Teeter Inversion Tables you will find that they have a model for everyone! Today I want to help you decide which model is the best for you and your needs. I have been using Teeter Inversion Tables to help me with my own back pain for almost ten years. 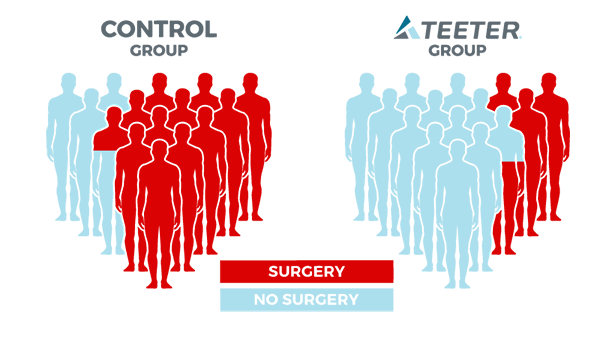 It has proven to be a tremendous help in getting my life back and I believe that they can do the same for you! In a preliminary study that compared two groups of sciatic pain patients scheduled for a lower back surgery. The group using the Teeter Inversion Tables showed back pain relief after just 30 days. While both groups included physical therapy. Only one group used the Teeter Inversion Tables. They incorporated one 2-minute Teeter session, 3 times per week, over the course of 30 days. That test group lowered their need for spinal surgery by an amazing 70.5%! That is a very telling statistic if you ask me! The Teeter Inversion Tables are the only FDA-Cleared Inversion Tables. They have proven to reduce sciatic discomfort as well as other disc related back pains. The Teeter works by using “Progressive Decompression”. This means that each disc is decompressed by the same body weight that compresses it while upright. 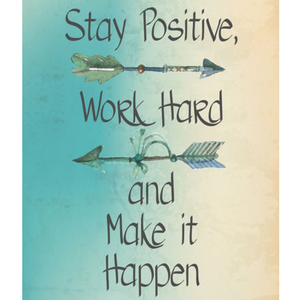 Keep this thought in mind: Relieve The Pressure – Relieve The Pain! Who Could Benefit From Teeter Inversion Table? The entire line of Teeter Inversion Tables have been given a Class 1 Medical Device rating. 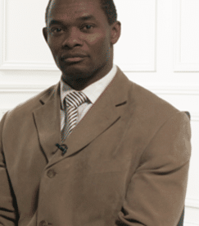 That means that they are suggested as a Desirable or Necessary course of action. Look if you are suffering from back pain and discomfort related to any of these conditions. I highly recommend you consider giving inversion a try! I suffer from two herniated discs in my lower back. My Tetter Inversion Table has become one of my most valued possessions. It has helped to allow me to maintain an active lifestyle, and I could never put a price on that! I have personally introduced dozens and dozens of people to the Tetter Inversion Tables line up. In all but a few cases, every person has called to thank me. 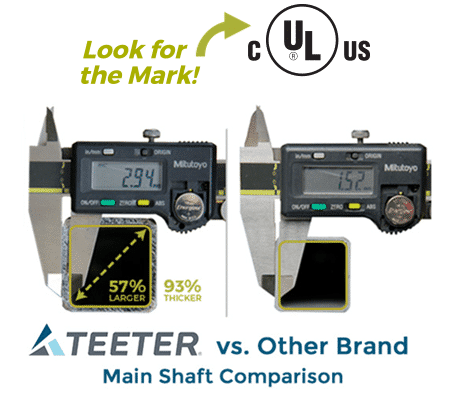 The results they are getting from Teeter are incredible! What The Doctors Are Saying About Teeter Inversion Tables! With more than half of the population of just the United States reporting some form of back pain. Inversion has begun to command a lot of attention. With more studies being completed, health and fitness experts have begun to turn to inversion as a possible answer. Here is what two Orthopedic Doctors have to say about Teeter and inversion. This is what Dr. William Tontz, a well practiced and highly respected Orthopedic Surgeon has to say. A daily routine which is what roger is recommending, is a very Good way to get your back in shape. Here is what another highly regarded and well respected Consultant and Orthopedic Surgeon has to say. The Teeter allows for significant reduction of the recurrence of back pain in my practice… it has enhanced the management of patient care and optimization of Non-Surgical spine treatments. So there you have it! 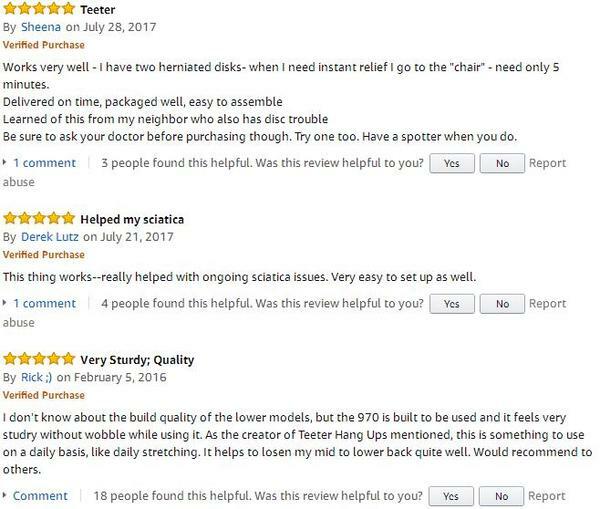 That is what the medical professionals are saying about the entire line of Teeter Inversion Tables. Similar opinions are coming out more and more each day as the benefits of inversion are becoming increasingly apparent. The Quality And Safety Of Teeter Inversion Tables Is Unrivaled! Trying to save a buck or two. I have tried a couple of other inversion tables. Those inversion tables did their job just fine. However I must admit that they were definitely not of the same quality as Teeter. Of all of the different brands of inversion tables I have owned. My Teeter has stood out above the rest. In the end I have tried out about a dozen different inversion tables in my time, and I always come home to my Teeter! You can put your trust in Teeter. They voluntarily comply and test to consumer products safety standards specific to inversion tables. Teeter Inversion tables are made with the best materials and design. 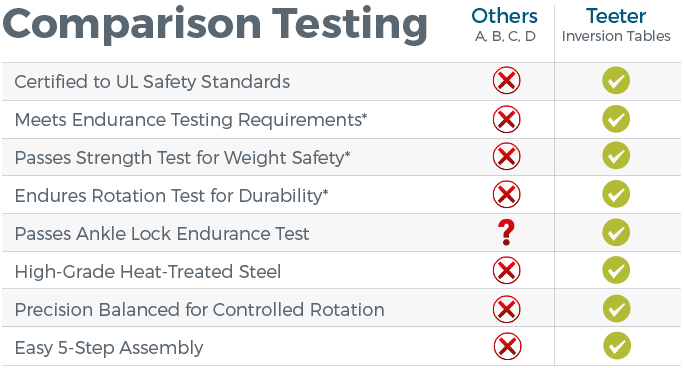 The only way to be sure that an inversion table is independently certified for quality is to look for the UL mark on the product. Having over 35 years of experience. As well as hundreds of advancements to maximize control, comfort, and effectiveness. The Teeter Inversion Tables are built to last and deliver relief for years. Another important feature is the ankle locks. Without question the Teeter patented ankle locks are the most secure that I have used. They are also much more comfortable than some of the other brands that I have tried. Okay so now you know all about Teeter Inversion Tables. It is time for us to take a look at each model that you have available to you! There are currently a handful of different models of Teeter Inversion tables that are available for you to choose from. While they are all made with the same precision and quality. There are many different features offered from one version to the next. I will now take you on a tour of the Three Top Sellers of the Teeter Inversion Tables and the different features each has to offer. Not to worry, there is one here for everyone and every budget, and I am going to help you find the One For You! Teeter Hang Ups EP 560 LTD! We will start with the base model package and also most budget friendly. That would be the Teeter Hang Ups EP 560 Ltd. The Teeter EP-560 LTD sets the bar in regards to comfort. It has patented wrap-around Ankle Cups for added support and security. While the Comfortrak bed optimizes stretching with its smooth surface and flexible, countered shape. Certified quality with UL listed label insures that Teeter Inversion Tables consistently outperform their competition. Beating them in endurance and rotational control with patented security features and heat treated steel parts for unrivaled security and durability. Make no mistake, just because this is the base model does not mean that it is not a Teeter! This will give you all of the benefits of any other Teeter. It just comes with a few less bells and whistles helping to keep the price down. PREMIUM FEATURES: Acupressure Nodes (8) in total with varied heights for trigger point release and focused relief. Plus the Lumbar Bridge with adjustable arch for added support. UNMATCHED COMFORT & SUPPORT: Patented wrap around ankle cuffs for a comfortable fit. Contoured Bed flexes for comfort and allows for a deep stretch for maximum relief. PRECISION ROTATION FOR TOTAL CONTROL: It is easy to use. Simple arm motions shift your body weight so you can effortlessly invert and return to the starting position. UL 3rd-PARTY SAFETY CERTIFICATION: Built with heavy gauge steel construction and patented security features. The Er 560 Ltd boasts a 300 lb, 4ft 8in- 6ft 6in user capacity. 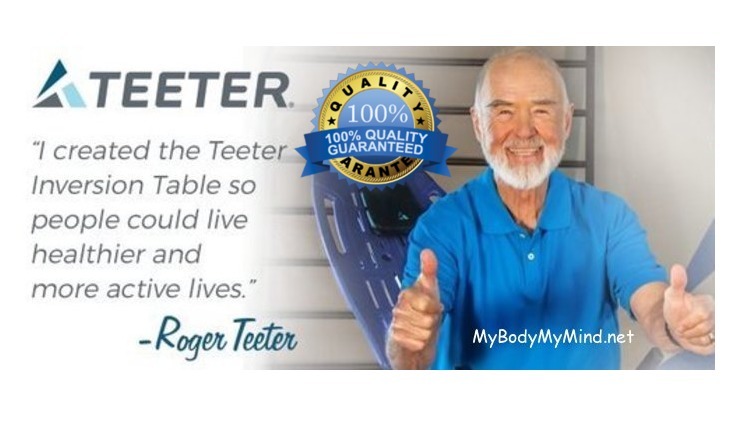 TRUST TEETER: Your teeter Inversion table comes with a Five Year Full Warranty, Easy 5-Step Assembly, and a 35 year legacy of quality and safety. 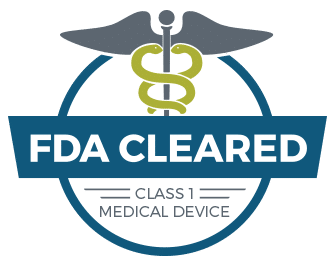 FDA & HEALTH CANADA CLEARED CLASS 1 MEDICAL DEVICE: Teeter Inversion Tables are the ONLY FDA & HEALTH CANADA Cleared inversion tables indicated to relieve back pain, muscle tension, herniated disc, sciatica, muscle spasm, and more! Current Price: $335.22 & FREE Shipping Eligible. Financing Options: The EP 560 Ltd is available for financing with the Amazon.com Store Card. Domestic Shipping: Currently this model can only be shipped within the U.S. and to APO/FPO addresses. International Shipping: As of now this item is not eligible for international shipping. Average Customer Review: 4.6 out of 5 stars 1,262 customer reviews at the time of this article. Amazon Best Sellers Rank: #1,295 in Sports & Outdoors. Warranties: All Teeter Inversion Tables come with a full 5 Year Warranty. Product Dimensions:The EP 560 Ltd measurements are 84 x 86 x 28.8 inches and weighs in at 65 pounds with a shipping weight of 69 pounds. Safely supports people up to 300 pounds. Well that brings us to the end of our look at the Teeter Hang Ups EP 560 LTD. As you can see, this model gives you the quality you might expect from a Teeter product at a great price! Check out this short video on the Teeter EP 560 Ltd. This is a great way to see the 560 LTD in action, and it gives you a chance to see the entire package that awaits you! Here is what a couple of Teeter 560 LTD customers have to say! *Note: This model is available with out the Acupressure Nodes and Lumbar Bridge. That model is the Teeter EP 560. It is the exact same as the EP 560 Ltd in craftsmanship and quality, just with out the extras. ($299) To see this model click here. Teeter Hang Ups EP 960 LTD! Okay so now you know all about the Teeter EP 560 line up. Let’s move on to the next model up the chain. That model is the Teeter Hang Ups EP-960 LTD. this one is a step up and has upgraded features included. The Teeter EP 960 LTD is everything the 560 LTD is and more!! So instead of repeating the same information over and over(although that might happen). I am just going to focus on the upgraded features of the 960 LTD.
Extended Ankle-Lock™ Handle: This feature is for those that may have limited mobility. This extended handle makes securing the patented wrap-around Ankle Cups much easier. Added Traction Handles: For those with limited mobility, these Traction Handles were added to assist in inversion as well as returning upright. Extra Long Stretch Max™ Handles: This featured adds extra stretching options and assistance. EZ-Angle™ Tether: The tether with this model features preset markings at 20, 40, and 60 degrees angles for your convenience. Check Out These Great Upgraded Features! Current Price: $429.00 & FREE Shipping Eligible. Financing Options: The EP 960 Ltd is available for financing with the Amazon.com Store Card. Average Customer Review: 4.6 out of 5 stars 578 customer reviews at the time of this article. Amazon Best Sellers Rank: #6,851 in Sports & Outdoors. Product Dimensions:The EP 960 Ltd measurements are 84 x 29 x 86 inches and weighs in at 70 pounds with a shipping weight of 75.8 pounds. Safely supports people up to 300 pounds. Okay, that brings us to the end of our look at the Teeter Hang Ups EP 960 Ltd. Here you can see Teeter has made some great improvements with this model! Check out this short video on the Teeter EP 960 LTD. This is a great way to see the 960 Ltd in action, and it gives you a chance to see the all of the upgraded features! Here is what a couple of Teeter 960 LTD customers have to say! *Note: This model is available with out the Acupressure Nodes and Lumbar Bridge. That model is the Teeter EP 960. It is the exact same as the EP 560 Ltd in craftsmanship and quality, just with out the extras. ($399) To see this model click here. Teeter Hang Ups EP 970 LTD! The Teeter EP 970 LTD is everything that you might have come to expect from Teeter by this point! It has everything the Ep 960 LTD has and yet they have upgraded it even more. So here again I am going to focus on the upgraded features. 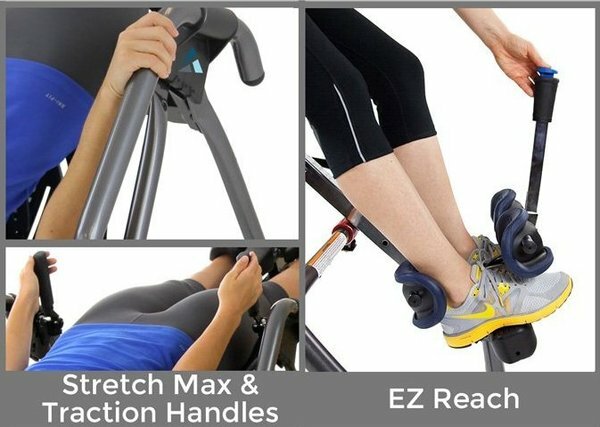 Deluxe EZ-Reach™ Ankle System:This offers an extra long handle that reduces the need to bend when securing the ankles. Deluxe EZ-Reach™ Features: This extended handle also offers smooth ratchet closure, gravity-activated safety lock and aero space grade stainless steel. Stretch Max™ Handles: Containing embossed inversion angle guide to add longer grip surface. This will assist new users and enhanced stretching options for the more experienced users. Check Out These Awesome Upgraded Features! Current Price: $449.00 & FREE Shipping Eligible. Average Customer Review: 4.6 out of 5 stars 15 customer reviews at the time of this article. Amazon Best Sellers Rank: #75,088 in Sports & Outdoors. Product Dimensions:The EP 970 Ltd measurements are 84 x 29 x 86 inches and weighs in at 73.4 pounds with a shipping weight of 74.2 pounds. Safely supports people up to 300 pounds. Well here we are at the end of our look at the Teeter Hang Ups EP 970 Ltd. Once again Teeter has taken Great and made it Greater! Check out this short video on the Teeter EP 970 LTD. This is a great way to see the 960 LTD in action! It gives you a chance to see the smooth ratchet closure and gravity-activated safety lock being used! Here is what a few of Teeter 970 LTD customers are saying! *Note: The 970 model is only available in the Ep 970 LTD Complete Package version at this time. 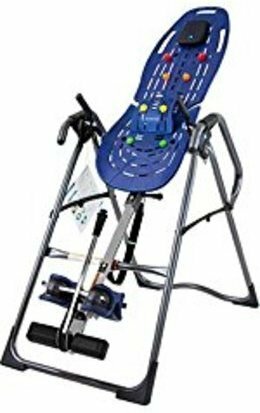 When you select the Teeter EP 970 LTD you are getting a top of the line Teeter Inversion Table. Complete with all the bells and whistles Teeter has to offer! Why Inversion And Why Teeter? Why should you use inversion? That answer is simple, It Works! While there are no case studies to date that indicate that inversion is a “Fix” by any stretch. Inversion has helped millions of people around the world relieve their back pain and discomfort. 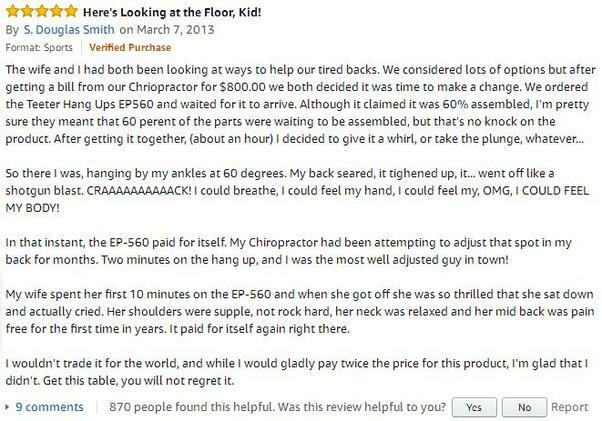 Inversion has helped people of all ages, and with varying types of back issues get their life back! If you have not tried inversion, maybe it is time! Why should you chose Teeter? Here again that is an easy one! Teeter Inversion Tables are second to none! With regards to quality, durability, performance, and service. Dollar for Dollar you will not find a better inversion table Period! I have used many inversion tables along my way. I will admit that there are other good brands out there, but none of them match up to Teeter. Think about this, they have 35 years devoted to spinal decompression and inversion! What other company can say that?! Let’s face it, if you have made it to this point within this article you already know you are ready to give inversion a try. So if you are ready I can tell you this. You will not be disappointed with any of the Teeter Inversion Tables that we have covered here to day! As I mentioned before, I could not put a price on the effectiveness that my Teeter has had on my back pain. I can not begin to tell you the value of regaining mobility, becoming active again, and getting my life back! 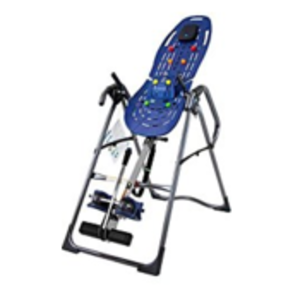 Get Your Teeter Inversion Table Right Here! So what are you waiting for? Take a minute and review the options above. I have given you everything you need to know to make the right decision for you. Don’t suffer any longer, imagine the possibilities of relieving or eliminating your back pain altogether. Imagine being able to live your life on your terms once again! Can you put a price on that? Don’t put it off any longer! 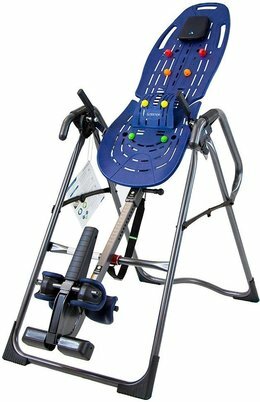 Order You Teeter Inversion Table Right Now! It will be delivered right to your front door in just a few days, and you can be on your way to a pain free back in no time! Here Is Where To Get Your Very Own Teeter Inversion Table Today! Some Words Of Warning Regarding Inversion! Here are some things you should know about inversion. As well as a few things you should consider before starting an inversion therapy regiment. First you should not expect inversion to replace surgical needs for a serious injury. In rare cases inversion has helped some people correct minor injuries but that is not the average result. Inversion Therapy should be used as one part of a comprehensive and long term treatment program. Spinal decompression’s such as inversion are great for temporary results. Also they can be very effective in reducing or relieving back pain with on going use. While inverted your heart beats slower and the pressure on your brain and eyes increases. You should not remain inverted for more than 5 to 10 minutes per session. For these reasons, you should not try inversion therapy if you have high blood pressure, heart disease or glaucoma. Also inversion is not for everybody! 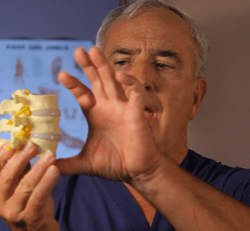 If you suffer from any of those conditions, or if you have had major back surgery in the past. You should consult with your medical professional before trying inversion. With that said you should always consult your physician before starting any program or regiment regarding your health. It always pays to be safe! I Would Like To Thank You For Visiting Us Today! If you have any questions or comments about my Teeter Inversion Tables Comparison. Please feel free to leave them in the comment box located below for the fastest response. If you prefer you can contact me directly through email. I will get back to you just as soon as I am able to! Thanks for checking out my article: Compare Teeter Inversion Tables – Here’s Your Best Option! Previous Post Previous post: Tight Hip Flexor Stretches For You To Try! Next Post Next post: Ironman Gravity Inversion Tables – Learn More! Teeter inversion Tables are going to be a fast relief formula for all the people who have back problem. As you mentioned that the test group people lowered their need for spiral surgery upto 70.5 % and that’s really miraculous. You have given all necessary details of this product requires to buy. It is true, the Teeter Inversio0n tables are quite amazing I have my own and I love it! The great thing about it is that it only takes me about 3 minutes, twice a day. Even with just that little amount of time I have noticed a huge relief in my own lower back. I was a little skeptical at first, but after just a few days I was hooked! 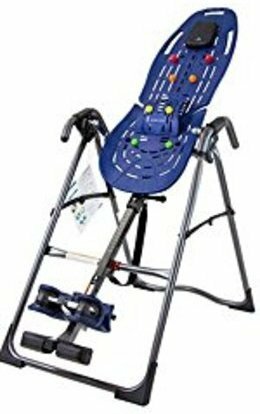 I would recommend anyone that is suffering from back pain and discomfort to at least look into a Teeter Inversion table and give it a try! These Teeter inversion tables may be just what I am looking for to help alleviate my sometimes unbearable back pain. I have degenerative disc disease and spinal arthritis, as well as arthritis affecting many of my other joints. It is all connected to the fact that I have Lupus. The flair can be very intense and be immobilizing at times. I am already on a cocktail of medications for my illness and pain and would love to find a way to eliminate at least some of the pain meds. I also use a Tens unit to help manage pain. Which does help but I think through years of use my body has become quite used to it. I guess what I am really getting at is I have some questions that I hope you can help me with. Of course, I will consult my doctor before trying one of these inversion tables but I would like to find out the standpoint of a real user would be. I understand this helps with the back pain but would I be trading one pain for another? Having arthritis in other joints, is the table stressful on those joints when inverted? Like your knees and ankles? I also watched all the videos for each unit. I would likely decide on the EP 970. I like the longer handle, I think it makes it easier for me to use. It made me wonder is it advisable to have another person around when using this table? I did not hear a mention in the videos or in the article. Looks like it inverts and resets easily without help but I would like to be sure of that. Thank you for the great in-depth article and review/ I am hoping this is something that I can try. Look forward to your response. I can certainly see why you would want to cut out at least a portion of the pain meds if possible. While your situation sounds a bit more problematic than mine, I to suffer from an injury in my lower back. Personally I feel as all the pain meds do is mask the problems and really do not provide much relief at all. The Teeter Ep 970 is a great choice! With the EZ Reach Ankle System and the Stretch Max Handles it is a prefect choice for someone with your conditions. These features are a great upgrade from the EP 560, and make using the table far easier. I personally on invert to about 60 degrees, which is controllable by using the control strap included with the table. This safety strap allows you to decide how much inversion you experience, and 60 degrees is just as effective as complete inversion. Also by not inverting completely, you greatly reduce the pressure on your ankles. I find the pressure on my knees to actually feel good. As this process stretches the surrounding muscle and ligaments, but that is just my feeling on the topic. Generally I would say the ankles may be the only issue, and to tell the truth, I do not find it to be all that bad. Another thing to consider is that you do not need to hang for long time periods, thus helping to control the pressure felt on your ankles. I usually hang for about 3 or 4 minutes twice a day, and I feel that small amount of pressure on my ankles is well rewarded with the relief I receive in my back! Now Christina I must admit, at first it may feel a bit strange to invert. I did have someone around the first few times I inverted, not to help me because it is very easy to do. But rather as a safety precaution because I did not know what to expect, and there is nothing wrong with you doing the same thing. The ankle locking system is very well built and I find it to be quite secure and safe. Keep in mind that I weigh around 250 pounds. So believe me when I tell you that you are very safely held in place while inverted. Once you have gotten the feel for it, and have built your trust with the Teeter inversion table. You will find it to be no problem to do it on your own without the presence of another person. Using the table is not difficult at all. Just set your safety strap for the level of inversion you desire, lock your ankles into place and raise your arms. The balance of the table does the rest. However Christina you can always use the EZ grip handles to slowly invert yourself. Truthfully this is the approach I use to this day and I have been using my table for years. When it is time to end your session, you can again use the handles to bring yourself to the upright position. I like this the best because if you go to fast from inversion to upright, you may experience a head rush. So it is best to take it slow. Christina there a just a few other things I would like to point out for you. One is that at first you may not feel the relief you desire as your body and muscle need a bit of time to adjust. You will be stretching things differently than you ever have, so in the beginning it may actually feel awkward. However these feelings will quickly pass and you will begin to experience the amazing feeling of the stretching that is going on inside of your body. The second thing is that if you are still concerned with the pressure you will have on your ankles, there is another option for you. That option is the Teeter Dex II Decompression and Extension Machine. This is an inversion platform that is stationary. The Dex II is an ideal alternative to an inversion table. It can deliver the opportunity for decompression and extension without requiring you to hang upside down. While I myself like the true inversion table, this is a great secondary option used by many people. Christina you can read more about the Dex II by clicking the link I have for you and reading my full review on it: Teeter Dex II Review. Well I hope I have not missed anything and I have helped to address your concerns. Please let me know if you need any further info, as I will be happy to help in any way that I can!